Monitor settings controls your monitor(s) resolution and refresh rate. 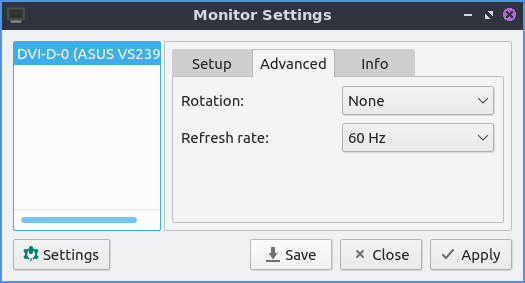 Lubuntu ships with version 0.14.1 of monitor settings. If you use a single monitor you can change your single monitor resolution on the right hand size and select your resolution. When you change your resolution you will be asked to confirm to make sure you don’t make a choice that makes it harder to use your computer. If you want to rotate a monitor on the Advanced tab from the menu labeled Rotation choose the way you want to rotate the monitor with inverted being upside down. Below you can also choose the refresh rate of monitor from the Refresh rate drop down menu to choose how fast your monitor refreshes. To display info on your monitor click the Info tab and read that info. The fields explained will be the Name of the monitor the serial numberthe size of the display and the serial number. To save your monitor settings press the Save button and a pop up will show that your have your settings OK for you and press Yes. To view your saved settings press the Settings button. Your saved settings are by default saved under the time and date. If you want to apply your saved settings press the settings button with the gear around the lightbulb. To choose your saved settings press the setting you want and the Apply button and your settings will be applied. To give your saved settings a meaningful name you can press the Rename button with a name for what you want and can remember what it is. If you want to delete these setting later press the Delete button. With multiple monitors you can in the set position tab you can drag the different screen around drag the two monitors around. 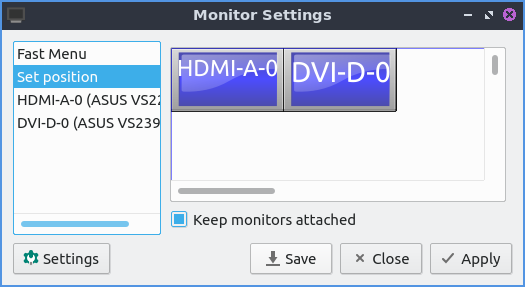 The checkbox for keep monitor attached pulls the monitors pixels adjacent to each other. The fast menu extended view sets you to set extended showing different things on different monitors. Selecting a unified view shows the same thing on both screens. First only shows up the first screen while second only shows only the second. The tabs towards the bottom are settings for each monitor.